Are you sick of Christmas yet? I sure am. I am finally recovering from what I casually refer to as my Christmas Hangover. No, I didn't drink so much, but the out of state visit to a variety of family proved to be draining, along with hoping for constant weather cooperation......so here's the last I will mention about Christmas until I am provoked to next year. Here is the final picture of the cast at the last performance of A Christmas Carol, here in Poultney, Vermont. Having just had wisdom tooth extraction a day or so before the performance I couldn't quite put it together to get some photos, but luckily Michael was there to get not only this pic, but all the following videos as well. So, get ready, the actors did a terrific job and enjoy these post-holiday videos. You can access the youtube channel here. Enjoy! 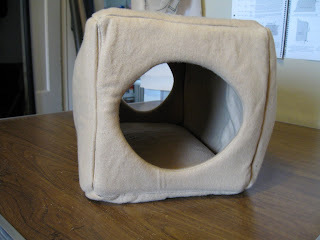 A place for kitty to hide, nap, or hangout. *If you want the outside and the lining to be two different colors, I would get an extra yard of fabric. *Also, this is the kind of project that can cost more to make- unless you are diligent and get your foam (which can be expensive) on sale. Think Jo-Ann Fabric, they have tons of coupons, or you can catch a 50% off sale. Check out the videos on how to make a small circular cape, in a relatively small amount of time. This is by special request for a new friend in New Zealand.